There have been accusations in the past that I am rubbish of letting go of things. Whilst I like to protest that this is untrue, the last couple of days has made me realise that it's time to face up to my denial and admit that I am unable to let go of the Olympic Food Challenge. It was just nineteen short days in length and yet, here I am two days after, still mourning its passing. I must adopt a 'Feel the Fear...' approach to this and do some kind of ritual with candles and consign the OFC to a happy chapter in my past. But for now, there's still a smidgen of caviar in my fridge and it would be a shame to let it go to waste, which is why I found myself troughing on blinis this past lunchtime. 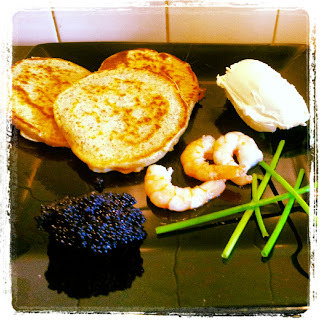 A blini to the uninitiated is a Russian drop scone, made using buckwheat flour and yeast and served with caviar. You also see it commonly served with prawns and smoked salmon too. As I had the leftovers from Sunday's Danish open sandwiches to play with, it seemed like the obvious choice for a fast, tasty and posh working-from-home lunch. Having run out of yeast at the weekend though, I faced the dilemma of whether or not the recipe would work without the extra lift. Then I remembered an oft-used trick for pancake recipes that require a little extra bubble in them. Fizzy water. Or as Miss A calls it 'Funny Water'. With some baking powder and whipped egg white, this worked a treat giving me soft, light pancakes which were perfect topped with some Philly and the aforementioned caviar and prawns. 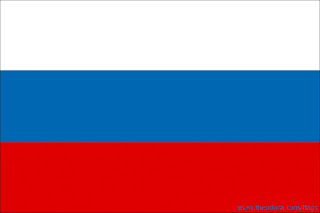 And because they originate from Russia, I will plaster a Russian flag on the post because I can. It's all part of the letting go. 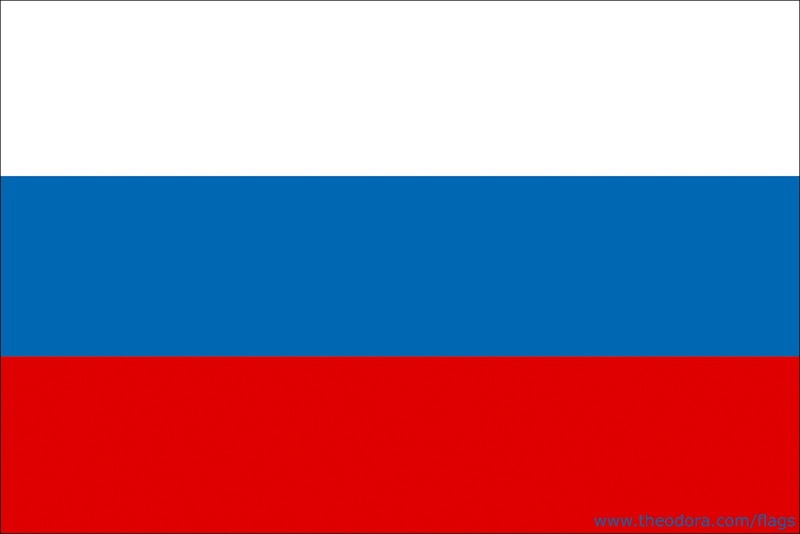 Now I just need to come up with a non-country-specific recipe tomorrow to break the flag-waving habit. And if I'm struggling to let go of the OFC, how on earth am I going to let go of my own blog in just 43 days time??? Whisk the egg yolk, water and milk together then combine with the flours, salt and baking powder to a smooth batter. Whip the egg white until it forms stiff peaks. Fold into the batter carefully. Decant into a measuring jug. Spray a frying pan with the spray oil and heat over a medium heat. Pour the batter into 2-3 inch diameter circles, spaced 1-2 inches apart. Cook for two minutes until the bottom is set and and bubbles start to form on the surface. Carefully flip over and cook for a further minute. Slide onto a warmed plate and continue cooking until all the batter is used.